Tomorrow night, I'm going to hear Kenneth Slawenski, owner of the dead caulfields website, discuss his recent book, J. D. Salinger: A Life. I won't be able to finish the book in time (my Kindle tells me I'm at 27%), but when I do, I'll post a review here. In truth, I've never been a huge fan of Salinger, who is most known for his one published novel, Catcher in the Rye. No, I'm not opposed to Catcher for the reasons some have wanted to censor it over the past six decades. I actually find the book to be well-written and very creative. My problem with Catcher results from the reality that I simply read the book too late in life. 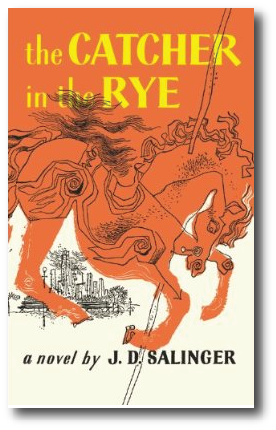 I feel that if a person is really going to connect with the book's protagonist, Holden Caulfield, it needs to be read around high school or college age. I was around 40 or 41 when I first read Catcher in the Rye, and I think it was simply too late for me to make a spiritual or emotional bond with the character. By the time I got around to reading the book, I'd already had a good bit of adult experience in life. Yes, I don't have much patience with phonies, either; but having been at an age where I'd already spent one part of my life teaching high school students, I simply wanted to wring Holden's neck at times while I read the book. Having already lost much of my own youthful ideals and having given in to life at times through compromises of my own, perhaps Holden would have called me a phoney! And yet, I don't feel that same disconnect when I've re-read Huckleberry Finn a couple of times in recent years. Why? Perhaps because I first read Huck when I was around 14, and I very much connected with him then. Moreover, Salinger's somewhat abrupt disengagement from public life had always struck me as a bit of a narcissistic act. I suppose I've always thought of him as a bit of a literary prima donna. However, I was curious enough about Salinger, the man, to request tickets to hear Slawenski. And in reading the first quarter of his book, I have to admit that I'm beginning to have new appreciation for both Salinger and his writing. The portrayal of Salinger presented in what I've read from Slawenski, so far, gives me reason to think that perhaps I judged Salinger too quickly and too harshly. So, I went back to the Amazon page for J. D. Salinger: A Life to look at some of the reviews of the book. I tend to often take reviews of books or movies with a grain of salt—perhaps because I occasionally write some of them myself. But I was surprised to read some of the harsh words that some reviewers, specifically those who only gave one or two stars to the biography, had for this book. As I read through the negative reviews, I feel like I perceived a few themes, such as Slawenski offers nothing new and Slawenski defends Salinger too much. One review even mentioned that NPR called the book "sludge." Now, I wouldn't say that the book is perfect. What biography is? Yet some of these reviews are more harsh than necessary—and this evaluation is coming from me, someone who's never really appreciated Salinger or The Catcher in the Rye all that much. And then it struck me why I believe the writer was receiving such a tough time: Slawenski is an outsider. He's perceived as someone who's "merely" a fan (with a fan website to boot!). It doesn't matter that he worked on his book for years and it was published by a major publisher (Random House) with their own team of editors and fact checkers. How dare someone like him try to interpret Salinger's life and works for us! Of course, whether Slawenski's critics like it or not, considering his work is the first book on Salinger published after the writer's death—at least for the moment—J. D. Salinger: A Life is pretty much the definitive biography of the writer's life. Reflecting on this drew me back twenty something years ago to when I was in college at Louisiana Tech University. I had decided to major in English after enjoying my first two classes in the subject that everyone in most liberal arts programs was required to take. My first English class specifically in my major was a course in American literature. We had to write a paper for the class that was based around a book by a major American author. In the first few days, I learned that my instructor (I'm tempted to state his name out of spite, but I'll refrain) was a published "expert"on three subjects: Twain, Faulkner, and the King James Bible (referring to the literary aspects of the KJV, as I never detected any spiritual devotion to the Bible in the man). 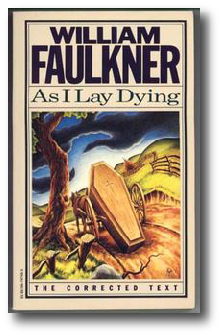 In my eager (and naive) attempt to impress this man, I decided to write my paper on William Faulkner's As I Lay Dying, which I had never read before this class. The image you see to the right is the exact same cover as that of the paperback copy I bought for the class (which I still have). I wanted my own copy instead of checking one out at the library, so I could make notes in the margins for my paper. I worked very hard on the paper—much harder than my "Bartleby the Scrivener" paper which had been assigned to me by my teacher in my previous English class after I waited so long to pick a topic. On the day we were to begin presenting our papers, I let a couple of other students read theirs first, so I could get a feel for my instructor's reaction. After two successful papers, one on a Steinbeck novel and another on a Hemingway title, I volunteered to read my paper. I was certain that my professor would be pleased that I had picked a book by one of his favored American authors. I couldn't wait to get the paper back with "A" and "Excellent insights!" written across the top in red ink. How was I to know that the grade would actually fall two letters lower? As I reached the mid-point of the third page of my paper, the professor completely stopped me. This was a bit of a shock to both my classmates and me. I thought everything had been going quite well. Over two decades later, I still remember his expression of frustration and his exact words that continue to bounce around in my cranium from time to time. "Did you even read the book?" he asked. I think I may have stammered a "Yes," but if I did or if he heard me, it didn't really matter. I was humiliated. He then spent the rest of the class taking apart the points I'd already made and explaining the book to me. At some point in this, when I realized he wasn't going to let me finish my paper, I simply walked back to my desk, sat down, and listened to him continue his rant. When we met for the next class, no one would volunteer to read their paper, so the professor began calling readers randomly. As I said, I was naive. I had no idea that some profs were egomaniacs. While I thought I was gaining favor by writing on a topic he was interested in, I had no idea that to him, since he was the expert on the subject and I was the neophyte, there was simply nothing I could possibly contribute to the the discussion—at least not in his view. Fortunately, I stuck with my major, and I also still enjoy reading Faulkner, but it's a wonder I didn't give up on both after that experience. I've often said that much of how I relate to my students today comes as a reaction against some of the jerks I had in college. Yes, I read papers from students with which I disagree. I even read papers occasionally, where beyond mere disagreement of opinion, I believe the student is simply wrong in his or her assertion of the facts. But I don't belittle the student. I don't present myself as the expert and the student as the imbecile. I tell my students that I often learn new things from their papers; I often see insights to familiar subjects that I'd never thought of before. It's too bad so many of us go through life putting up walls of superiority between ourselves and others. It's too bad that we become so territorial in our own little worlds of ideas that we have no patience for outside voices. John said to Jesus, "Teacher, we saw someone using your name to cast out demons, but we told him to stop because he wasn't in our group." I remember having profs who would stop class to belittle students coming in late--as if their tardiness was a personal offense. What a waste of valuable class time! Speaking of wasting class time, in an advanced writing class, our teacher required us to write in journals daily. Then he would spend time in class, walking around the room reading our journals, sometimes aloud, and belittle us for anything he thought was funny or stupid. He also made us sign contracts that we would be in class on time. I'm certain it was partly the time--when the authority of the professor was absolute--and the fact that most of us were 18-22 years old. But I'd like to see someone try those kinds of stunts with me now. If Holden Caufield had no patience for phonies, I have no patience for jerks abusing their authority.